The 229-foot-tall (70-meter) Falcon 9 launcher climbed into a clear sky from Space Launch Complex 4-East at Vandenberg Air Force Base, riding a column of orange exhaust from nine kerosene-burning Merlin main engines. The Falcon 9 rocket lifted off at 6:17 a.m. PST (9:17 a.m. EST; 1417 GMT) after a 70-minute automated countdown sequence. The first stage’s Merlin engines vectored their thrust to pitch the rocket south-southwest from Vandenberg, and the booster shut down and jettisoned around two-and-a-half minutes after liftoff to fall into the Pacific Ocean. A few seconds later, a second stage engine ignited to finish the job of placing the Paz Earth-observing satellite and SpaceX’s first two broadband test probes into orbit. SpaceX confirmed the on-target release of Paz, the mission’s primary payload, around 11 minutes after liftoff. 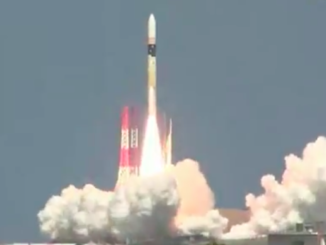 The company ended its live webcast before announcing deployment of the two broadband testbeds, which are also known as Microsat-2a and Microsat-2b. The launch company did not plan to recover the first stage on Thursday’s flight. It was the second launch for a booster that previously lofted the Taiwanese Formosat 5 Earth observation mission toward orbit from California in August. But SpaceX attempted to catch at least one of the Falcon 9 rocket’s fairing structures with a boat positioned in the Pacific Ocean west of Baja California. The shroud protects the rocket’s sensitive payloads from weather before liftoff, and it shields the satellites from the aerodynamic stress during the Falcon 9’s climb through the lower atmosphere. After soaring into space, the fairing jettisons from the top of the rocket in two pieces that open up like a clamshell and fall away behind the Falcon 9 upper stage. Engineers added cold gas control thrusters and parachutes to previous fairings in a bid to get one of the structures back intact, but SpaceX has not yet perfected the concept, and officials suggested previous experiments yielded mixed results. A fast-moving vessel set sail from the Port of Los Angeles this week for a destination under the Falcon 9 rocket’s flight track. 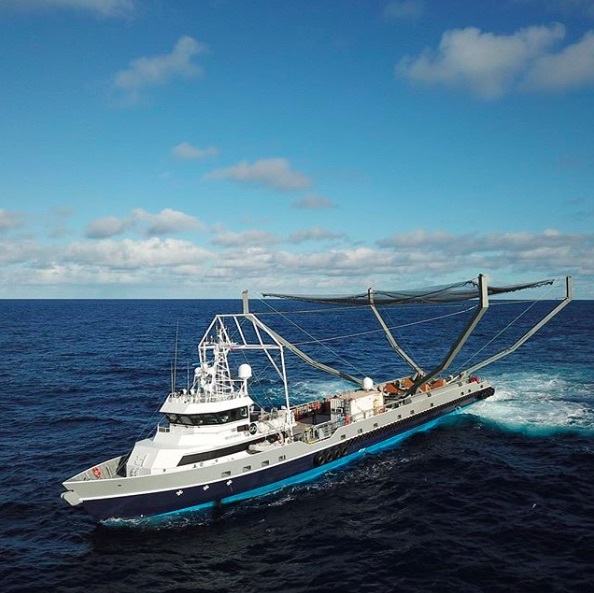 Photos of the boat, named Mr. Steven, show it sporting a net suspended between four metal posts to snare the Falcon 9’s payload fairing. 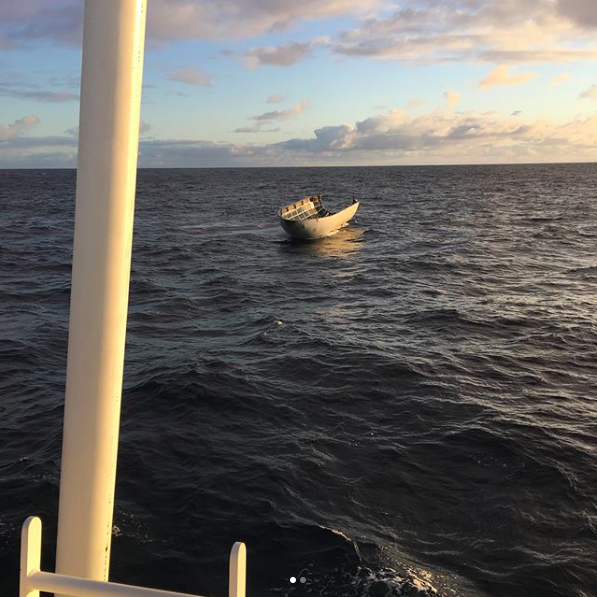 Musk wrote on Twitter that the fairing panel landed a few hundred meters from the retrieval vessel. He shared in an image on social media that showed half of the fairing intact floating in the Pacific. “Should be able catch it with slightly bigger chutes to slow down descent,” he wrote, later adding that the next fairing recovery try could come in about one month, likely on the next Falcon 9 launch from California targeted for March 29. Musk said Feb. 6 that the company was readying for the debut of an upgraded fairing designed for easier recovery and reuse. SpaceX delayed the launch from last weekend to Wednesday to complete checks on the upgraded shroud flying with Paz. SpaceX’s launch team aborted a countdown Wednesday due to unfavorable upper level winds. The successful recovery and reuse of a Falcon 9 payload fairing would be a first in the rocket industry. If SpaceX can make the concept work, it could shave millions from the cost of a Falcon 9 launch, which currently sells for around $62 million. Musk said last year the fairing costs around $5 million to produce for each launch. SpaceX’s reuse of first stage boosters already cuts the cost of many Falcon 9 launches, eliminating manufacturing expenses and bottlenecks. SpaceX says Falcon 9 customers will eventually see steep price reductions, but payload owners so far have been lured to reused boosters primarily by schedule shortcuts enabled by the practice, not price cuts. The 3,200-pound (1,450-kilogram) Paz satellite launched Thursday will capture high-resolution views of cities, landscapes and oceans with an X-band radar instrument. Paz measures more than 16 feet (5 meters) long and 8 feet (2.5 meters) in diameter. It is the largest satellite ever assembled in Spain, according to Alfonso Martínez, Paz project manager at the spacecraft’s prime contractor, Airbus Defense and Space, which constructed Paz in Madrid. Paz is owned by Hisdesat, which oversees Spain’s governmental satellite programs. The $200 million (160 million euro) mission, primarily funded by the Spanish government, will produce radar imagery for the Spanish military and its allies, plus commercial clients. The Falcon 9 rocket aimed to release the Paz satellite into a 319-mile-high (514-kilometer) polar orbit tilted around 97.4 degrees to the equator. SpaceX officials said the Falcon 9’s upper stage achieved an on-target orbit. Paz will share the orbit with two German radar satellites — TerraSAR-X and TanDEM-X — launched in 2007 and 2010. 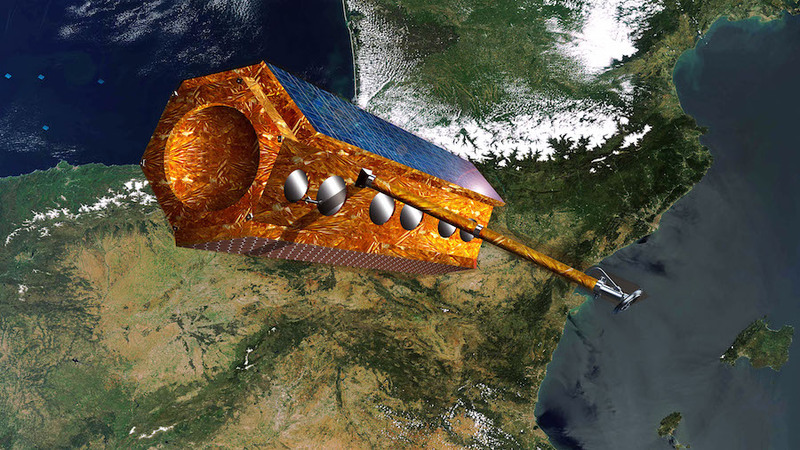 Airbus and Hisdesat will jointly manage the commercial sales and marketing of radar data from the radar satellite constellation, and the European Commission will incorporate Paz into its fleet of Copernicus Earth-observing missions. The trio of radar imaging spacecraft will together see almost any part of Earth’s surface in less than three days. On average, the satellites will record an image of the same region within 24 hours, according to DLR, the German space agency. Composed of nearly 400 individual transmitters, the Paz radar will beam signals down toward Earth and measure waves bounced off the planet’s surface, revealing fine textures and terrain details that can be translated into an image. The benefit of a radar observation satellite is the ability to see Earth’s surface under any weather conditions, day and night, while optical imagers are hampered by clouds and darkness. The radar will operate in several modes, with a high-resolution “spotlight” mode that can see objects on Earth’s surface as small as 10 inches, or 25 centimeters — a capability García Primo said will differentiate Paz from other radar satellites not designed exclusively for military users. “We have defined a very high-resolution radar mode that would be more government-oriented, but we have also have a medium-resolution and low-resolution (mode) with very wide coverage that could be for maritime surveillance and monitoring, or could be for environmental missions like oil spill detection, things like that,” he said. Paz established contact with a ground control center in southern Germany shortly after arriving in orbit Thursday, according to Airbus. Control of the satellite will be handed over to a facility near Madrid operated by INTA — the Spanish space agency — and Hisdesat in about five days. Testing of the Paz satellite will be completed in about three months, Airbus said. In addition to the radar, Paz carries a receiver to track global maritime traffic. Coupled with the radar imagery, the ship tracker will allow Paz customers to identify vessels at sea. Paz was originally assigned to launch on a Russian-Ukrainian Dnepr rocket — a converted Soviet-era ballistic missile — but political tensions between the two nations involved in the project has grounded the booster, once a popular choice for small satellite launches. Engineers completed assembly and testing of Paz in late 2014 to await a Dnepr launch opportunity. Hisdesat switched the launch of Paz to a SpaceX Falcon 9 rocket in early 2017. Thursday’s launch also marked a turning point for SpaceX’s broadband Internet project, a project described by company founder Elon Musk in 2015 as a revenue source for the company’s broad ambitions to explore the solar system. Until Thursday, SpaceX had said little publicly about the broadband network, dubbed Starlink, other than trickles of information disclosed in regulatory filings. 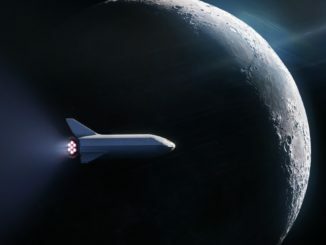 “If successful, (the) Starlink constellation will serve least served,” Musk wrote on Twitter. “Tintin A & B will attempt to beam ‘hello world’ in about 22 hours when they pass near LA,” Musk tweeted. SpaceX planned to place the two Starlink prototypes, developed by the company’s division in Redmond, Washington, into the same 317-mile-high orbit as Paz. The two test satellites will boost themselves into a higher orbit roughly 700 miles (1,125 kilometers) in altitude once ground controllers finish an initial post-launch checkout of the spacecraft, Patricia Cooper, SpaceX’s vice president of satellite government affairs, wrote in a letter to the Federal Communications Commission dated Feb. 1. In a previous FCC filing, SpaceX said Microsat-2a and Microsat-2b are designed for 20-month missions. Each satellite measures about the size of a mini-refrigerator and carries computer, power, command and control, propulsion and GPS navigation equipment typical for small spacecraft. 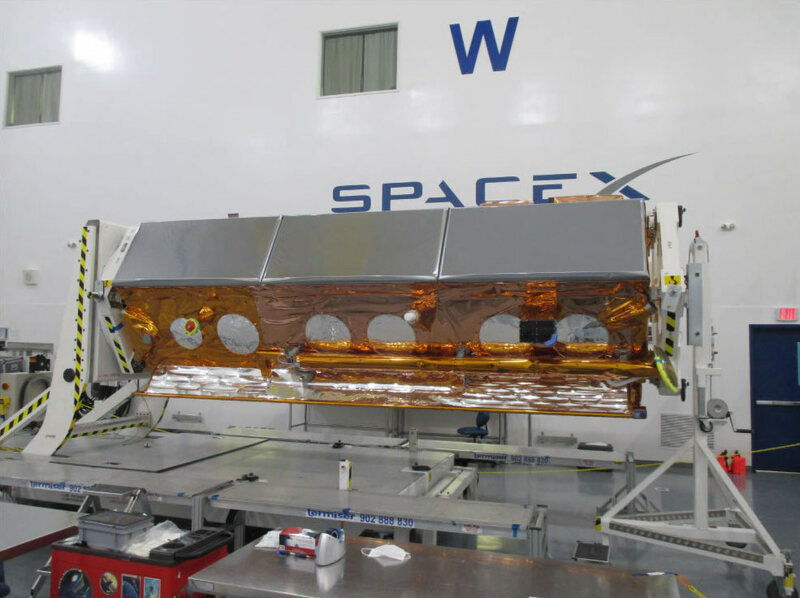 A Ku-band broadband phased array antenna and an inter-satellite optical communications link is also included on each spacecraft, according to SpaceX. “These are experimental engineering verification vehicles that will enable the company to assess the satellite bus and related subsystems, as well as the space-based and ground-based phased array technologies,” SpaceX officials wrote in a submission to the FCC. 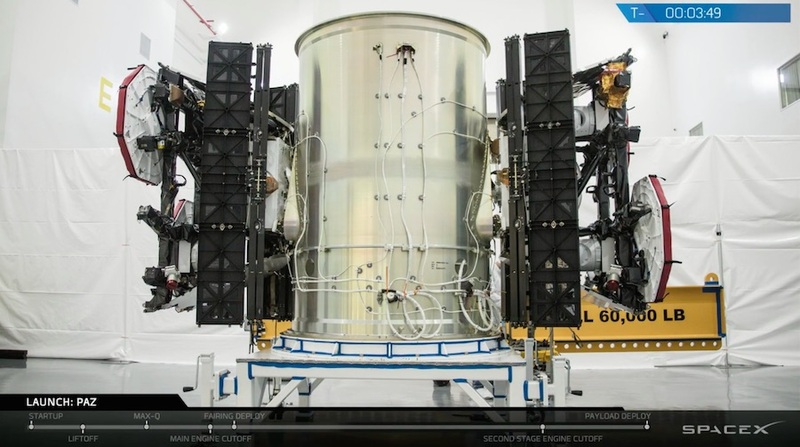 The first images of the Starlink testbeds were released during SpaceX’s launch webcast, showing the satellites attached to a cylindrical carrier structure. After the launch, Musk tweeted a video showing the satellites deploying from the carrier module. SpaceX plans to test the satellites’ compatibility with six broadband ground receiving stations in California, Texas and Washington. Engineers also want to validate broadband connections between the satellites and mobile terminals. 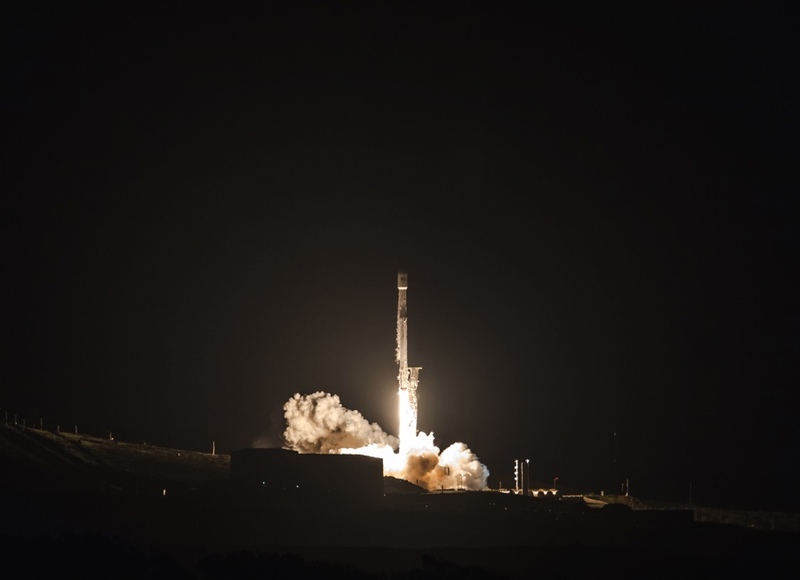 “These (satellites) are meant to gather data in advance of deploying and operating a satellite constellation that will provide Internet service,” said Tom Praderio, a SpaceX firmware engineer who provided commentary on the company’s webcast of the launch. In an application seeking FCC approval of the broadband fleet, SpaceX outlined a network that could include 4,425 satellites broadcasting Internet signals in Ku-band and Ka-band frequencies, a network originally proposed to the commission in 2016. The Ku-band and Ka-band satellites would orbit between 689 miles and 823 miles (1,110 kilometers to 1,325 kilometers) above Earth. SpaceX revealed plans for an expanded network in a regulatory filing last year. Besides the huge constellation of Ku-band and Ka-band satellites, SpaceX also proposed deploying 7,518 spacecraft transmitting broadband signals in V-band frequencies from low-altitude orbits around 210 miles (340 kilometers) above the planet. That would make Starlink the biggest satellite fleet in operation. The Ku-, Ka- and V-band combination “would provide both diverse geographic coverage and the capacity to support a wide range of broadband and communications services for residential, commercial, institutional, governmental and professional users in the United States and globally,” SpaceX said in a proposal submitted to the FCC for approval. SpaceX has not set a timetable for completion of the network, but FCC Chairman Ajit Pai last week said he supported the plan. SpaceX’s chief competitor in the broadband market is OneWeb, founded by satellite industry entrepreneur Greg Wyler and backed by Airbus, Virgin, Qualcomm, New Delhi-based Bharti Enterprises, Hughes Network Systems — a subsidiary of EchoStar Corp. — Coca-Cola and Totalplay, a company owned by Mexican billionaire Ricardo Salinas Pliego. OneWeb aims to build nearly 900 satellites in a factory located near NASA’s Kennedy Space Center in Florida, and the first set of test craft will launch later this year on a Russian-made Soyuz rocket from French Guiana. The FCC has already approved OneWeb’s proposal to offer Internet-via-satellite services in the U.S. market, along with a more modest 117-satellite low Earth orbit communications network being designed by Canada-based Telesat. The regulatory body has also granted a request from Space Norway to operate two low-altitude telecom satellites to improve coverage over the Arctic. Backers of the low-altitude “megaconstellations” say they will offer higher-speed, lower-latency broadband service than possible from bigger, conventional communications satellites positioned in geostationary orbit more than 22,000 miles (nearly 36,000 kilometers) over the equator. The next Falcon 9 launch is scheduled for early Sunday from Cape Canaveral with the Hispasat 30W-6 communications satellite, another Spanish-owned spacecraft. 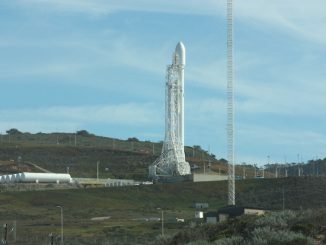 The next SpaceX mission from Vandenberg Air Force Base is set for March 29 with 10 Iridium voice and data relay satellites.